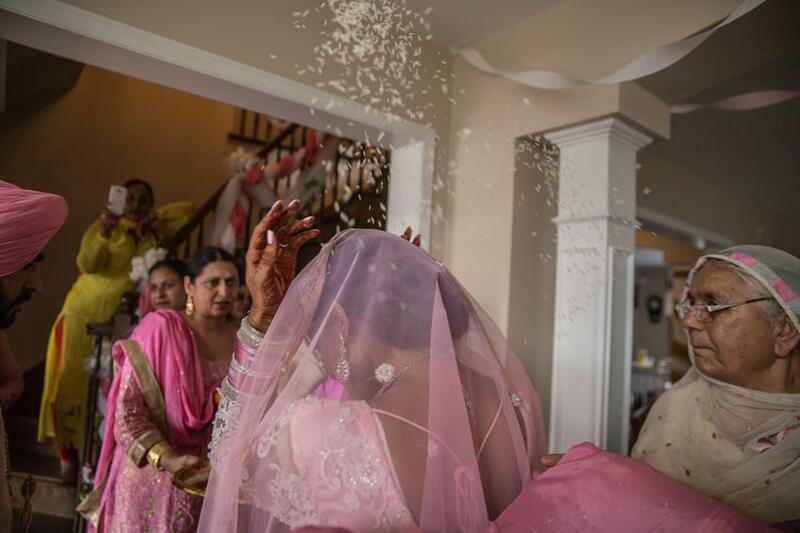 “Once in a while right in the middle of ordinary life, love gives us a fairy tale” – happens to be true for Indu and Manik’s wedding. 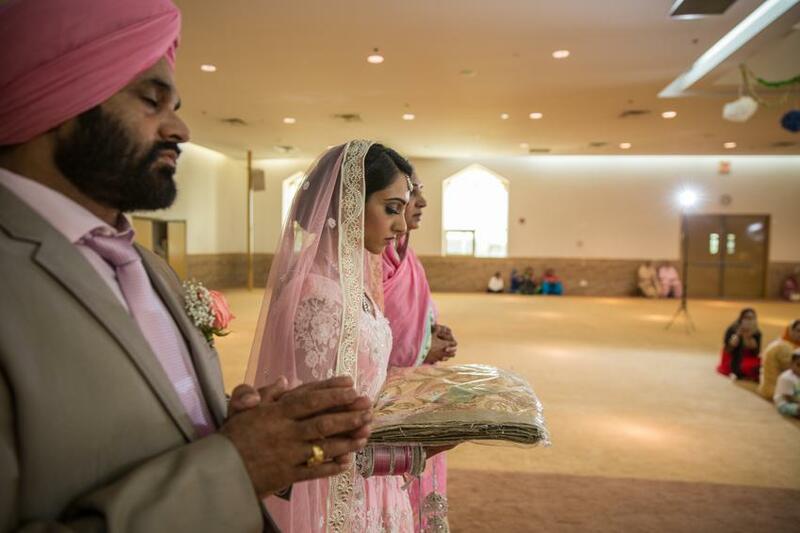 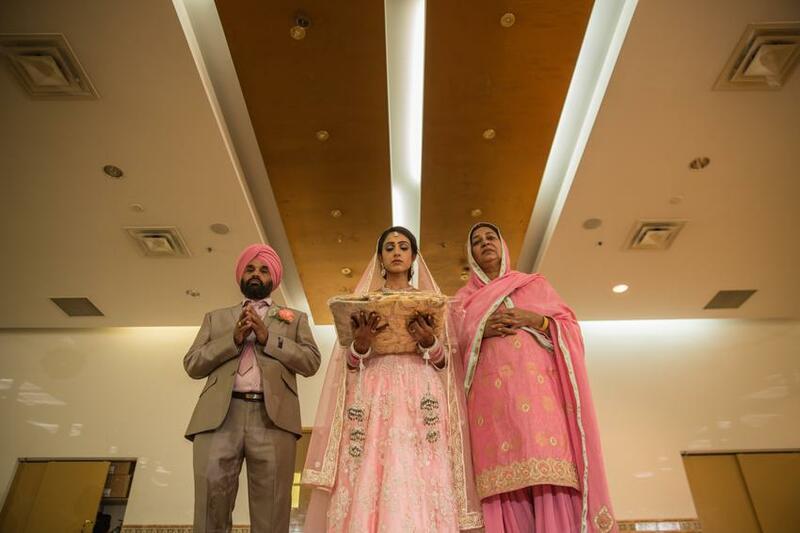 Indu and Manik had a beautiful fairy tale Sikh wedding ceremony. 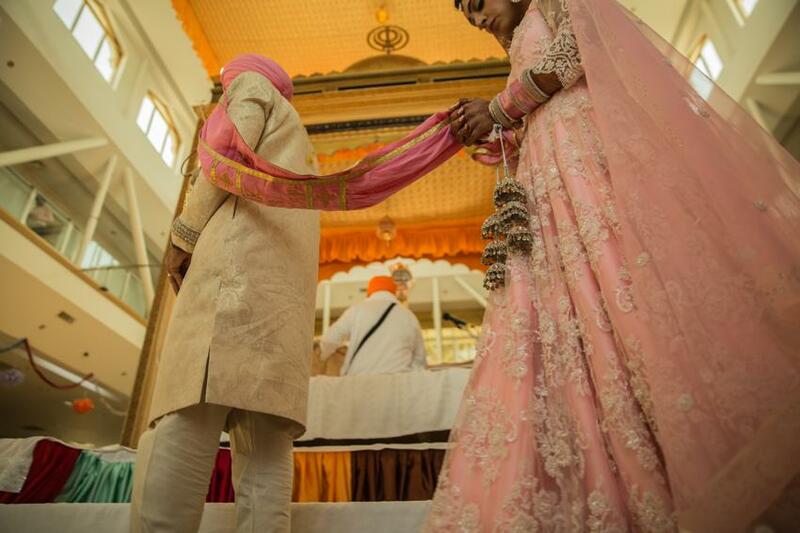 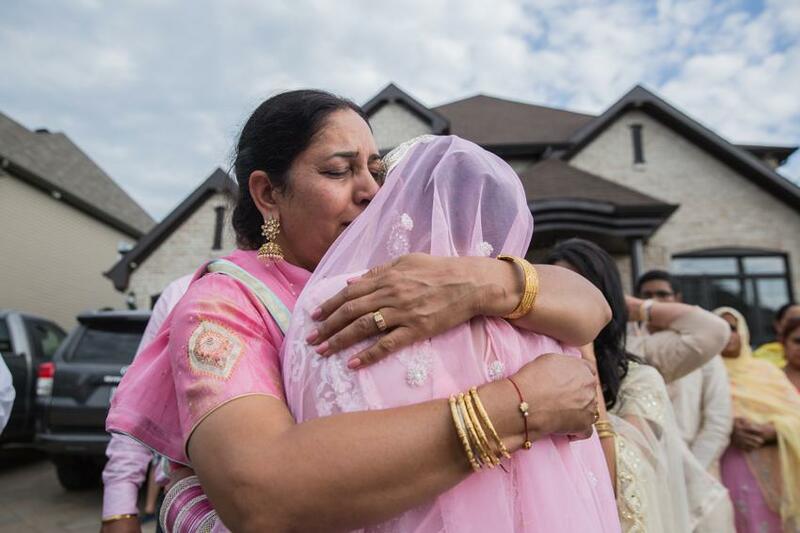 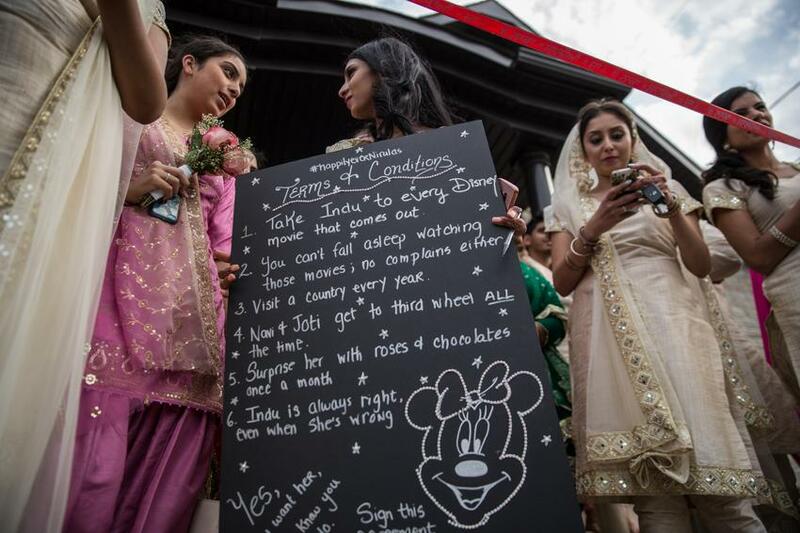 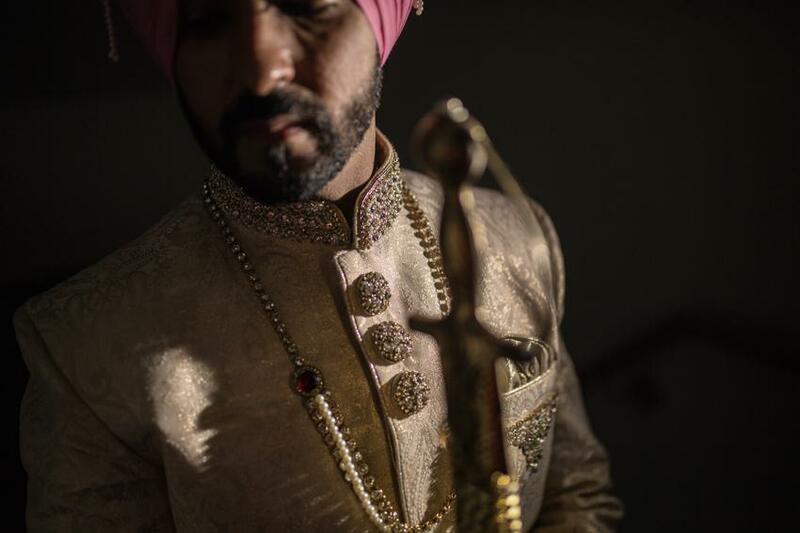 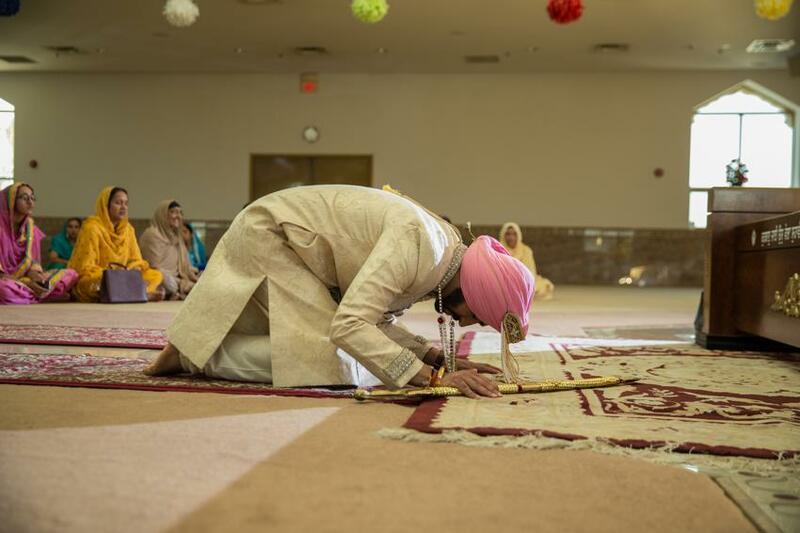 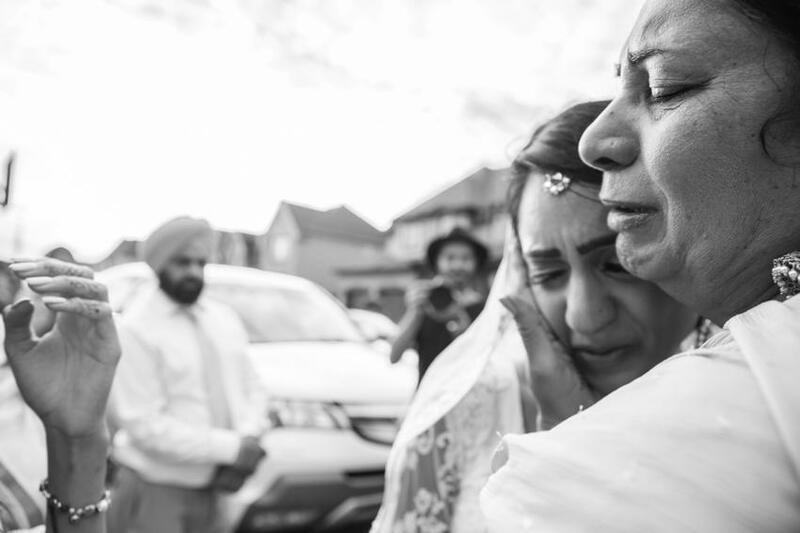 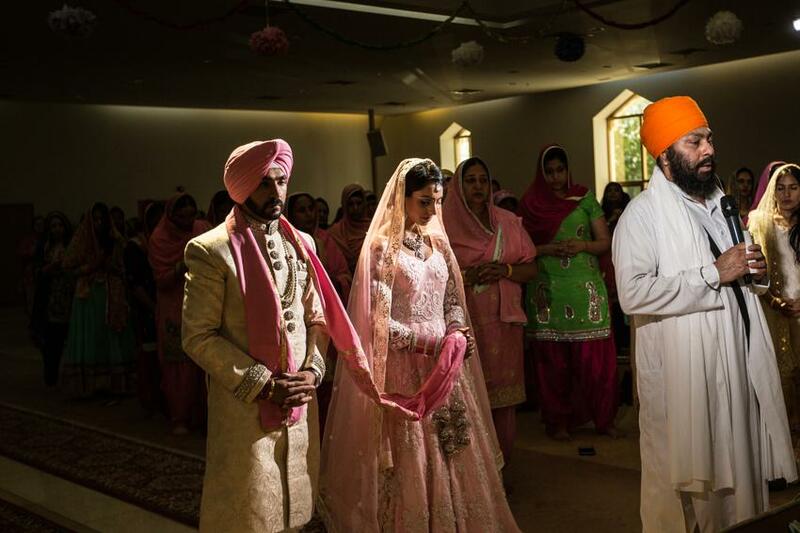 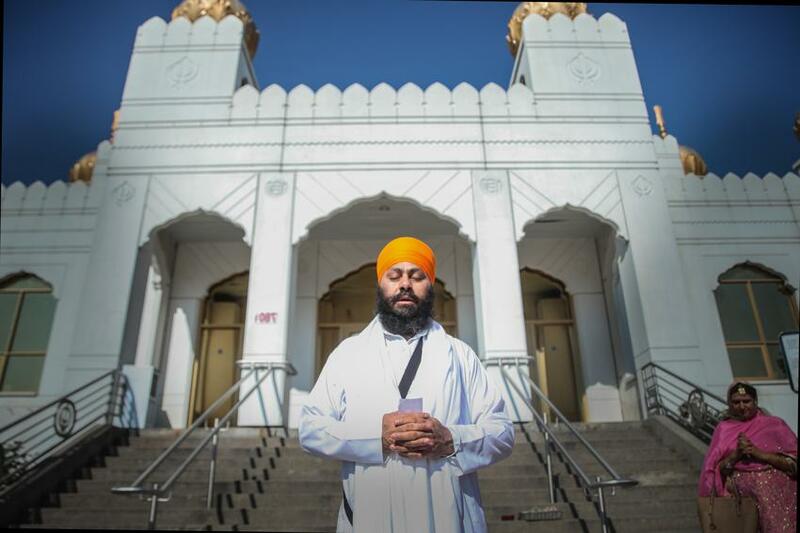 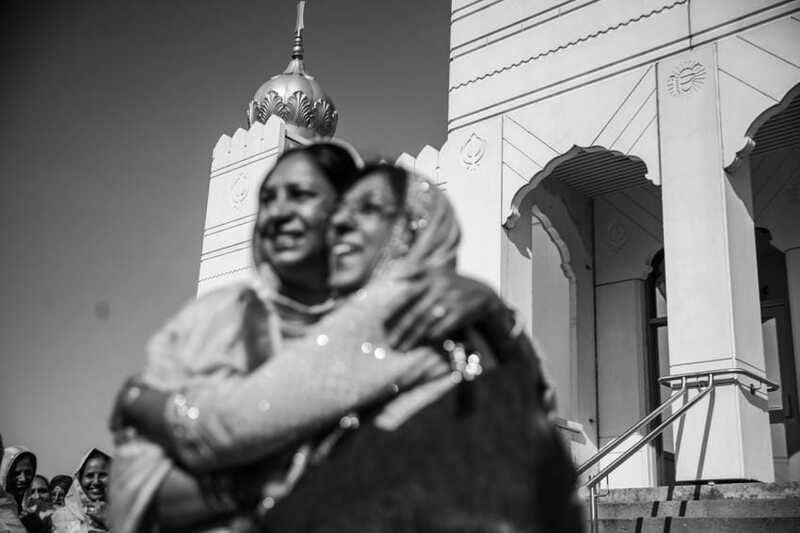 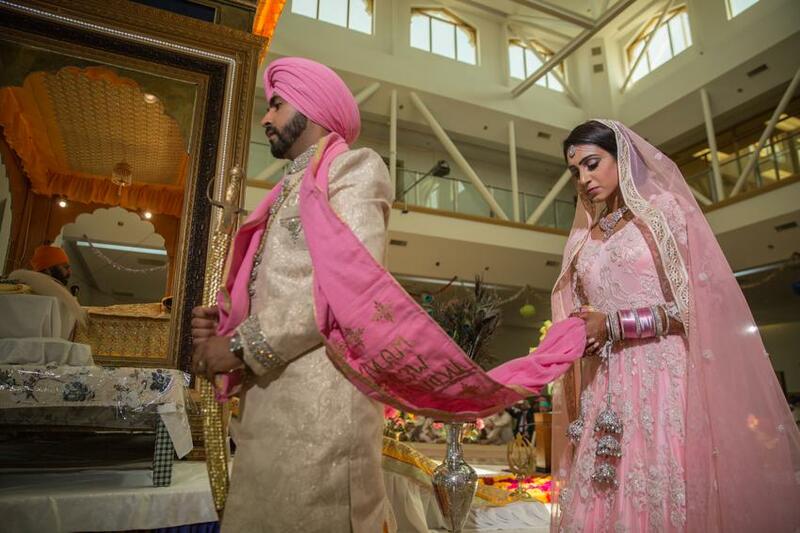 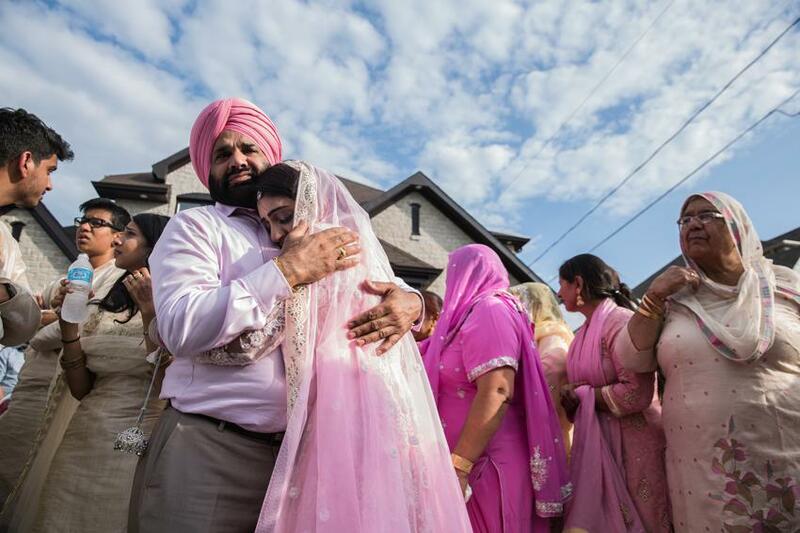 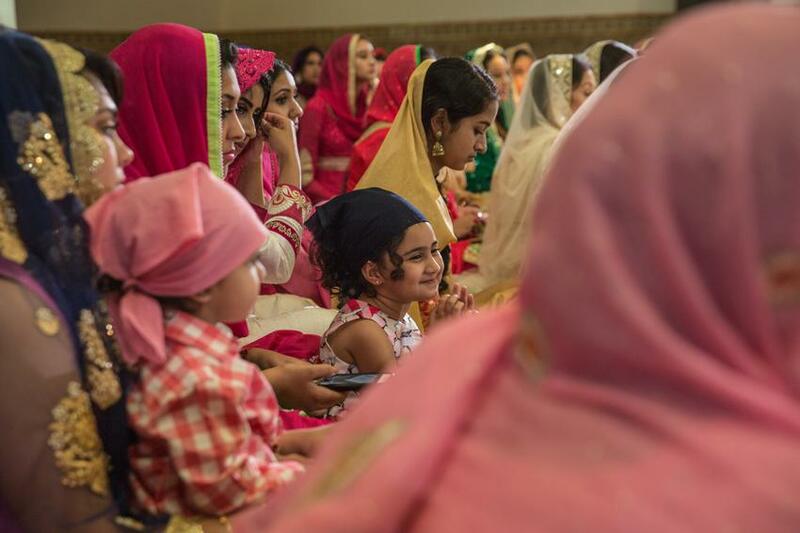 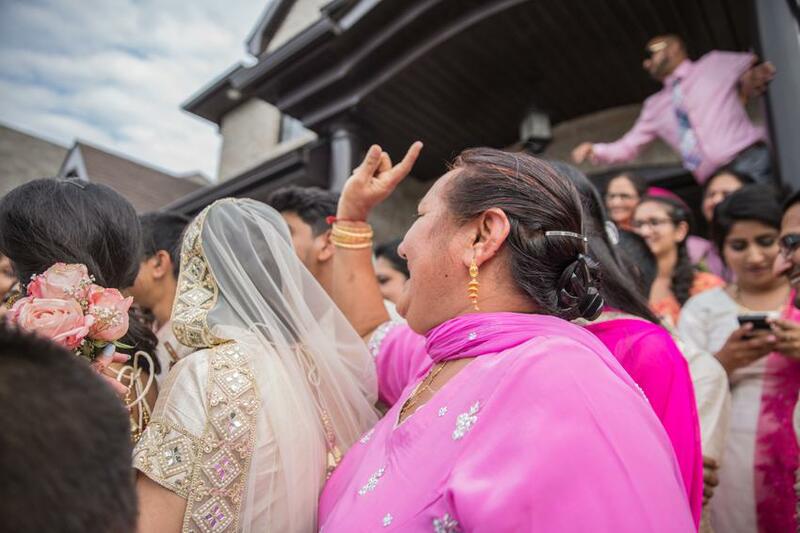 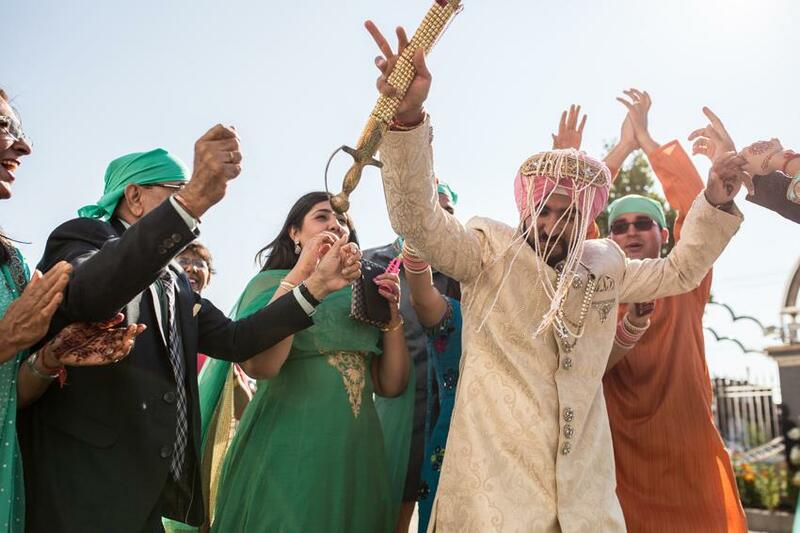 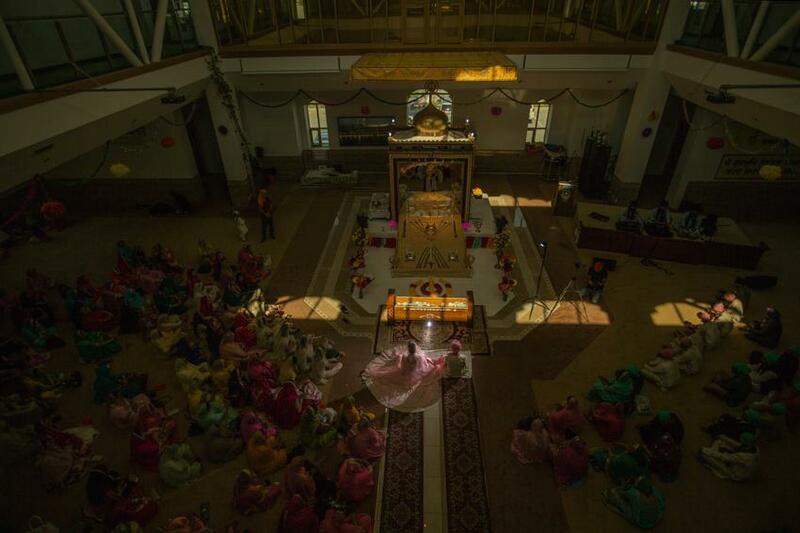 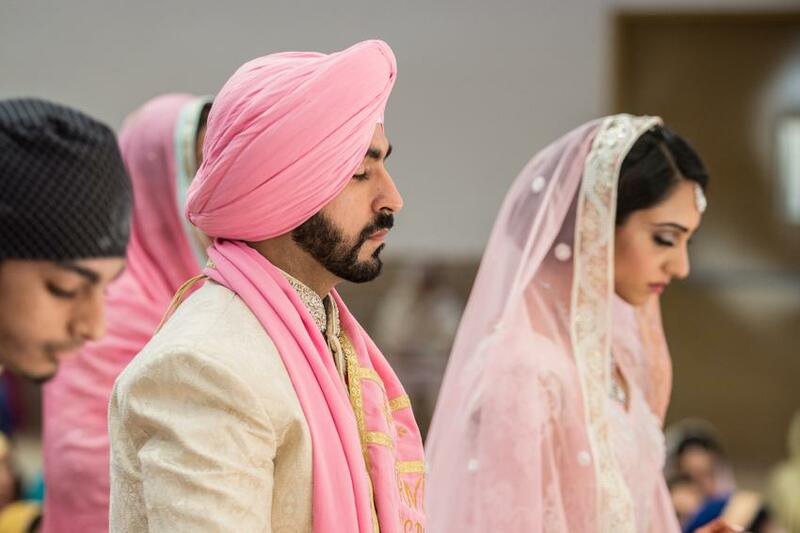 Inspired by Disney, this Indian Sikh wedding was full of magical moments. 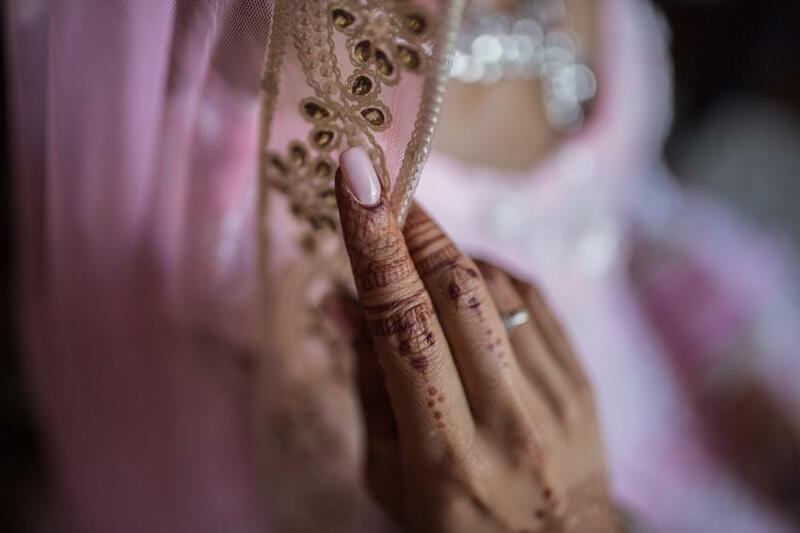 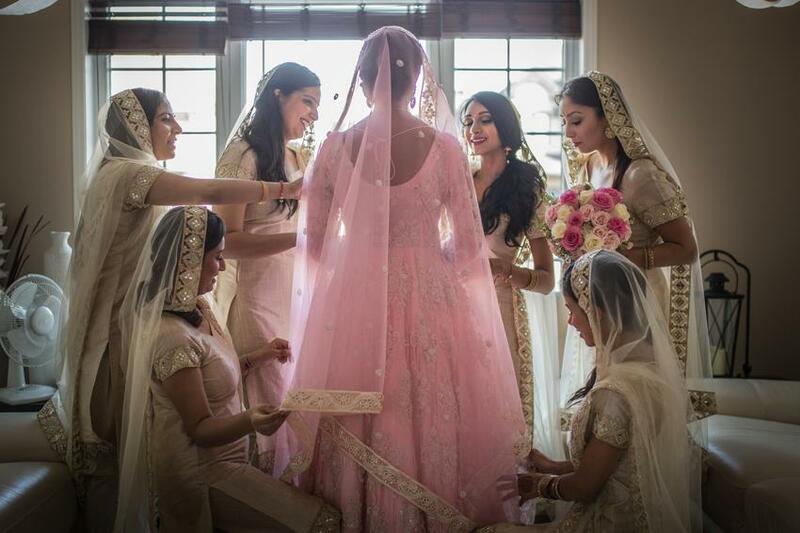 On the wedding day, Indu wore a beautiful baby pink gown. 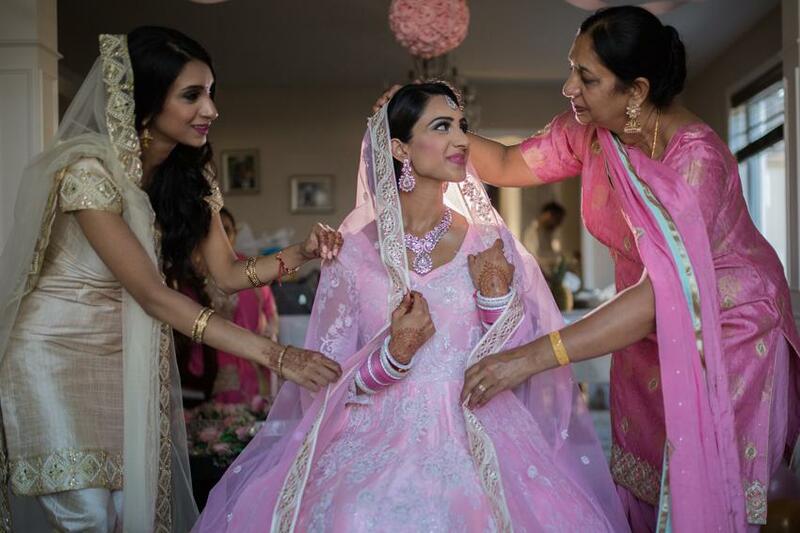 The gown was a fusion of western and Indian wedding dress. 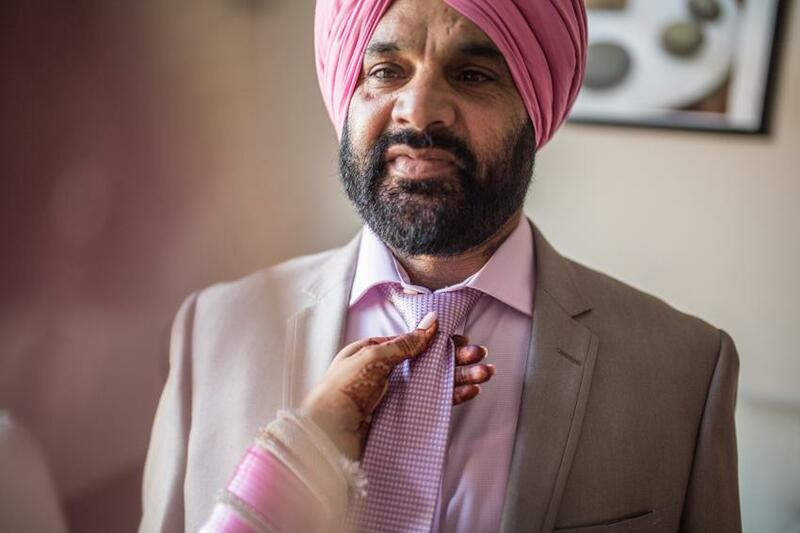 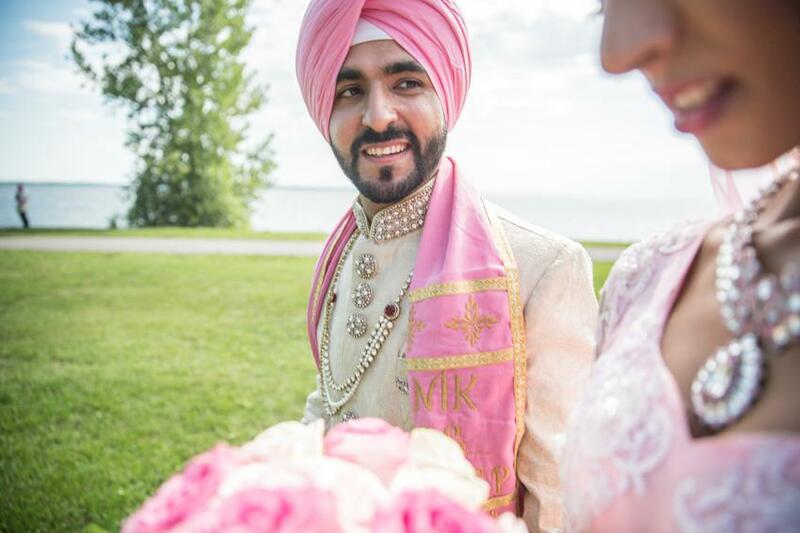 The groom looked charming in his royal sherwani paired with pink turban. 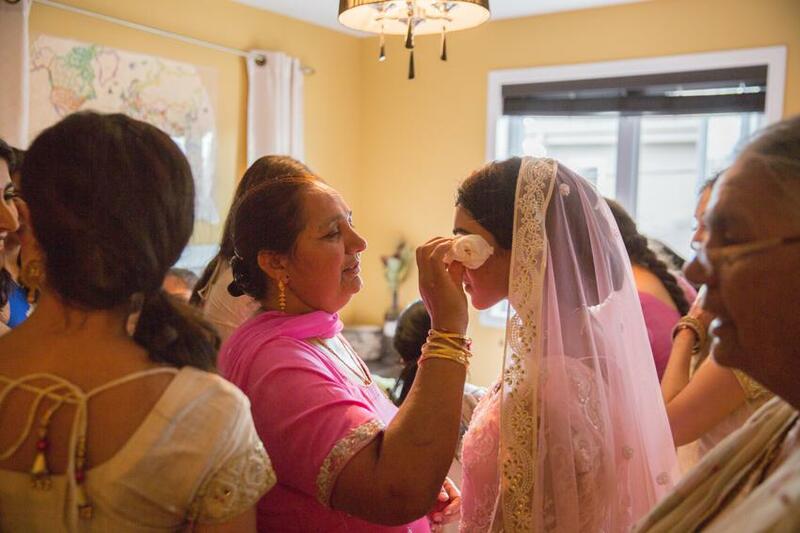 Getting ready photos for Indu’s wedding are a perfect example of a bright and airy style photography. 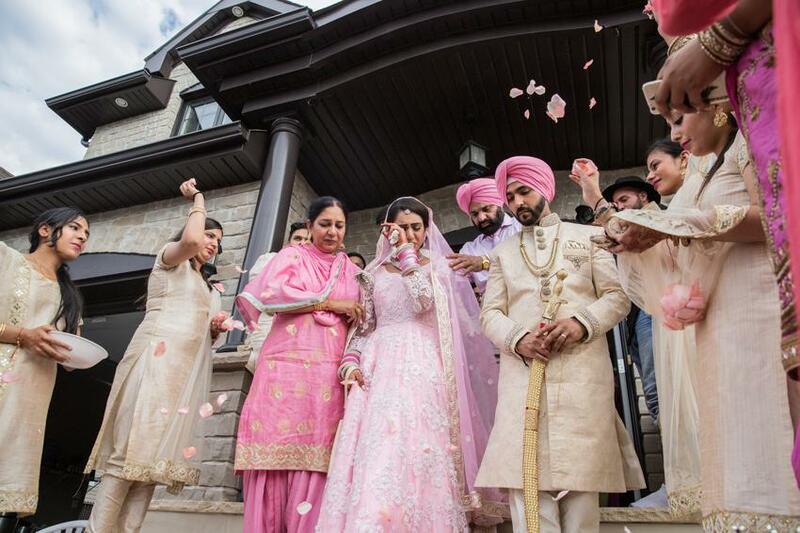 With a bouquet of pink roses, natural lightning, motherly love along with sister and bridesmaids’ efforts worked well for the setting. 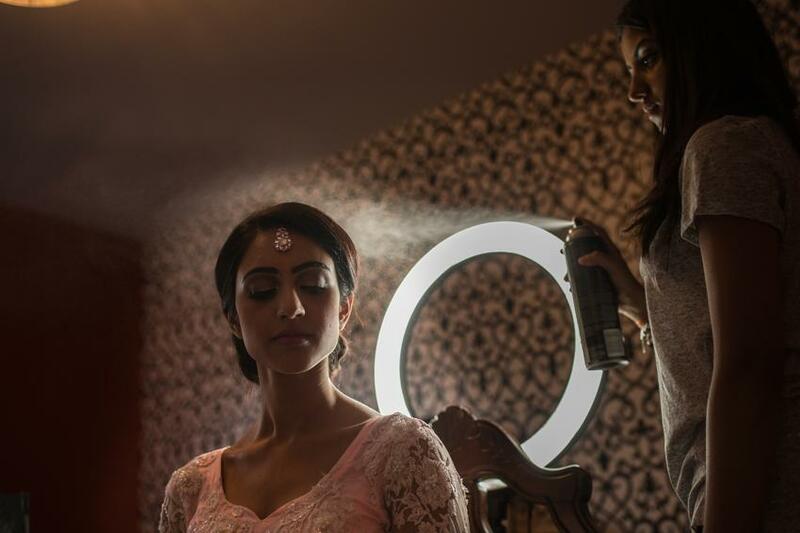 Aishwarya from Reve Studio took care of bride’s hair and makeup. 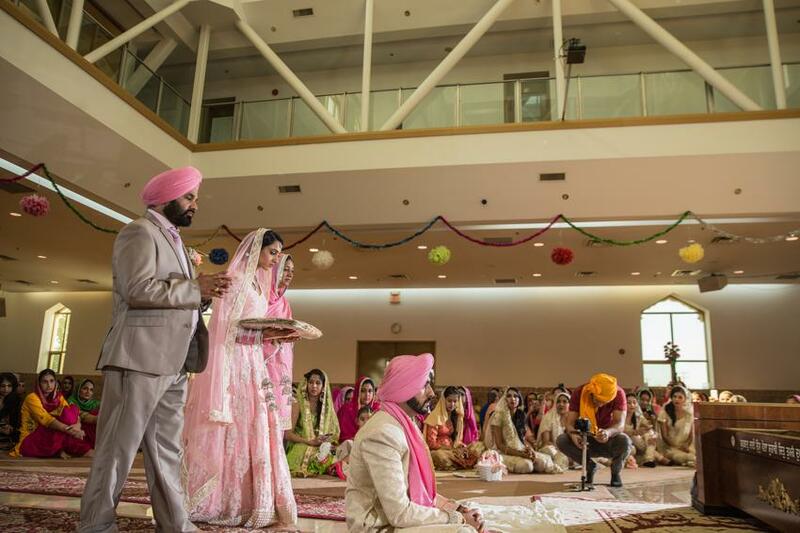 The venue for the wedding was one of our favorites, Lasalle’s Nanak Darbar, which is known for its beautiful architecture. 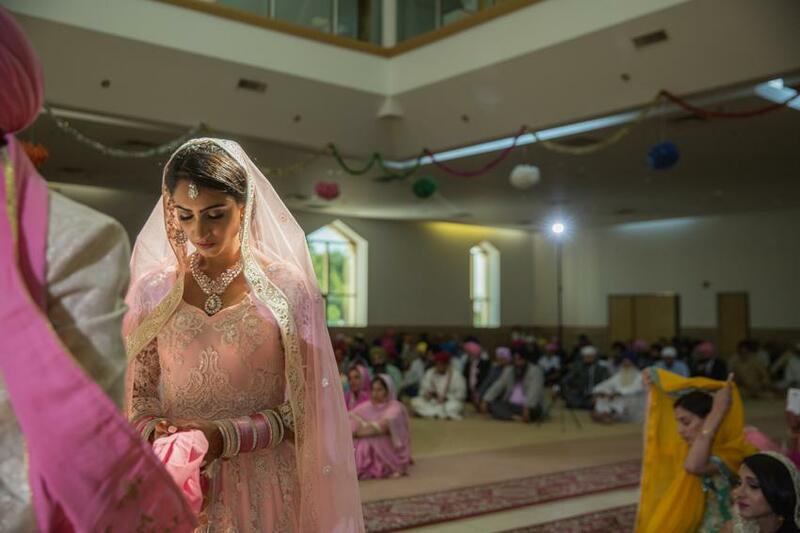 The bride walked down the main hall with her parents and bridesmaids before the Sikh wedding rituals commenced. 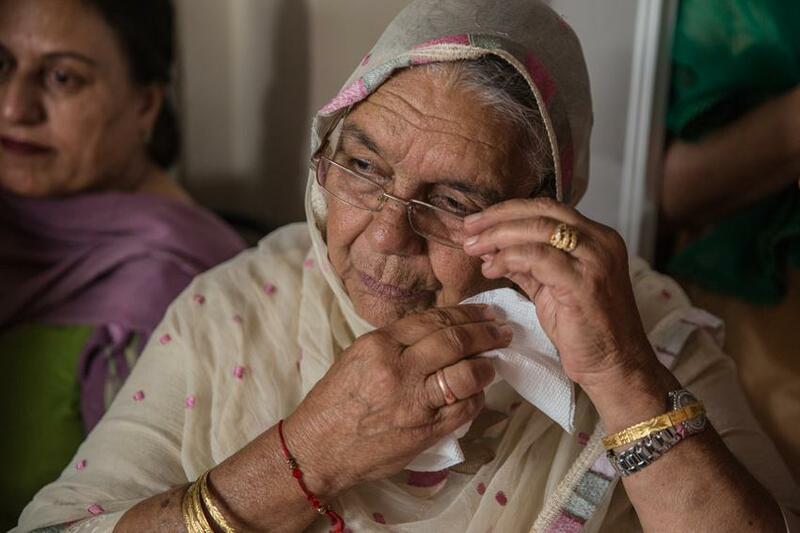 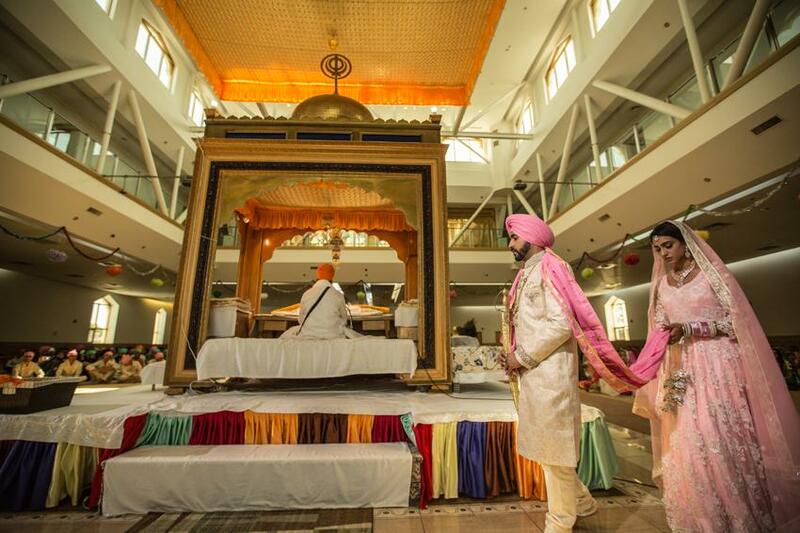 On completion of prayers, the couple was pronounced husband and wife in the presence of Guru Grant Sahib Ji. 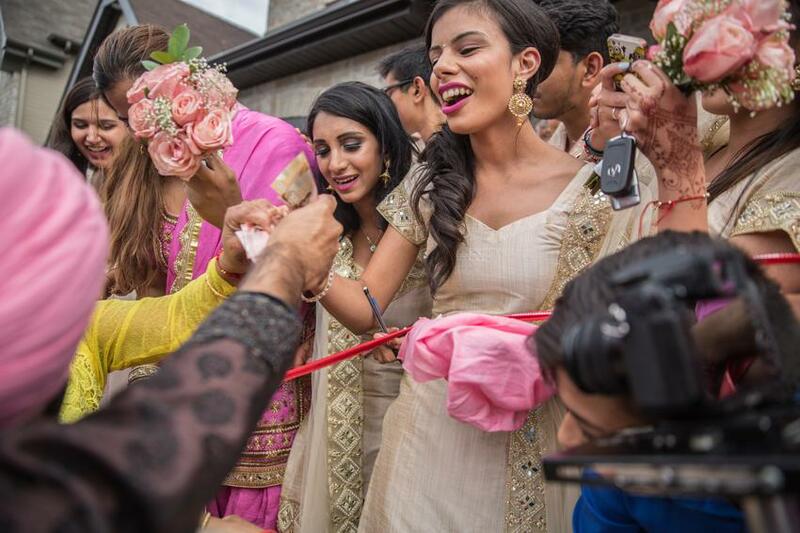 After the wedding ceremony was completed, we moved the bridal party along with grooms’ friends to Lachine Canal. 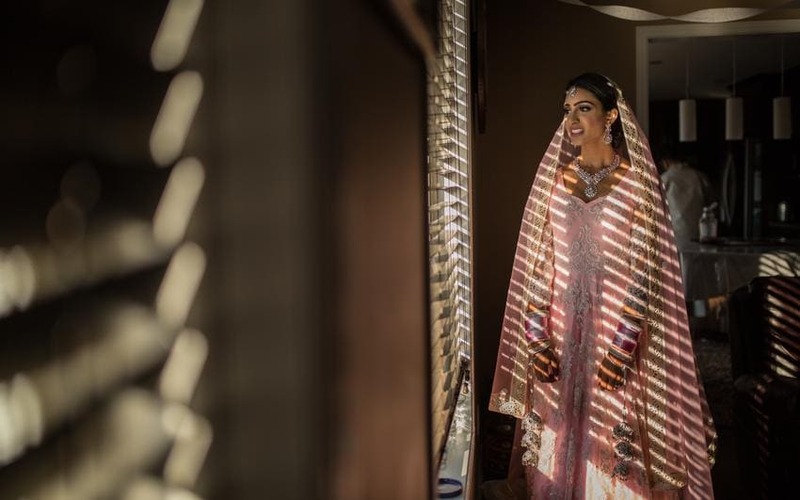 Here, we took the opportunity to capture bridal portraits. 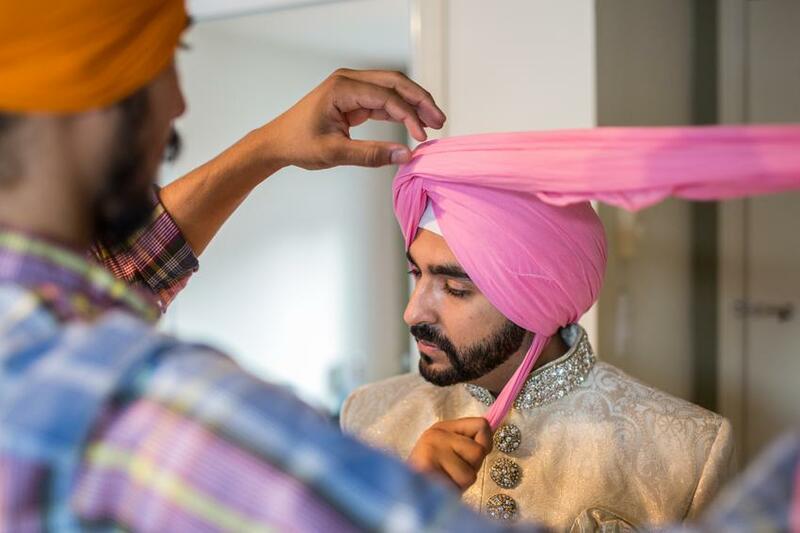 For post-wedding photo shoot, it is recommended to spare 30 minutes each for the bridal party and the couple. 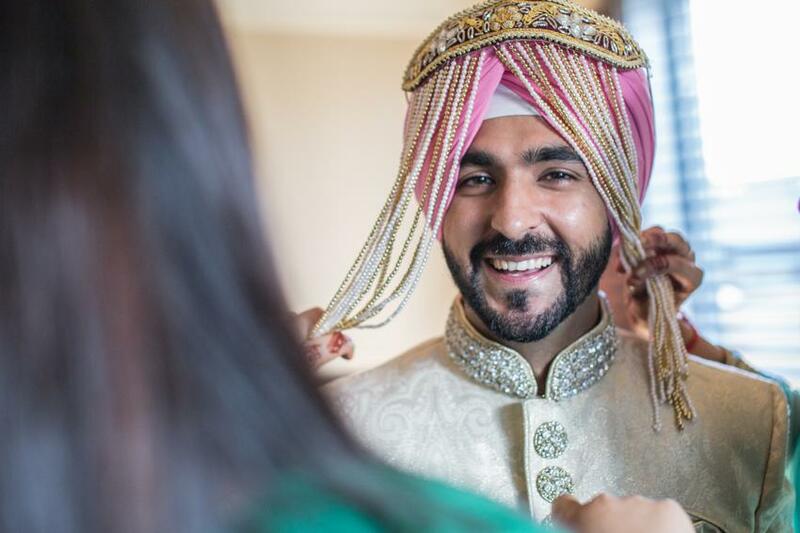 Tip – It is always a good idea to let the bridal party (bridesmaids and groomsmen) leave after their part of photos is done. 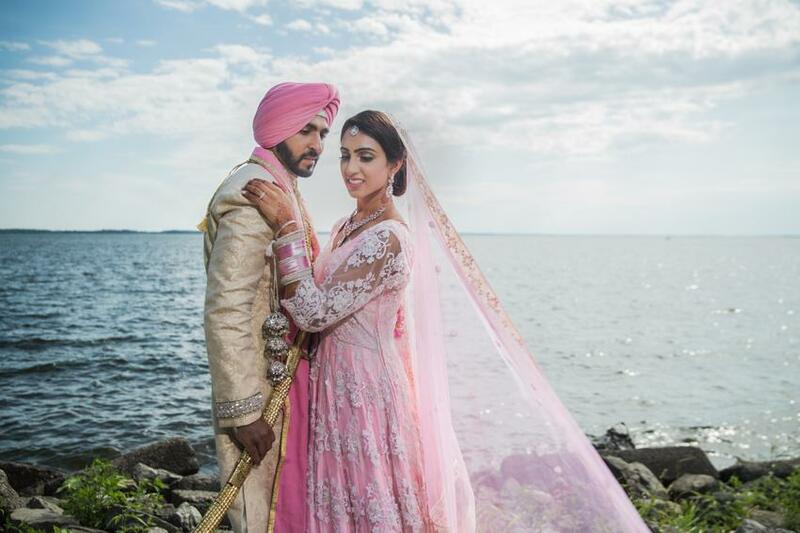 It helps your photographer focus better and you as a couple feel more comfortable and less distracted. 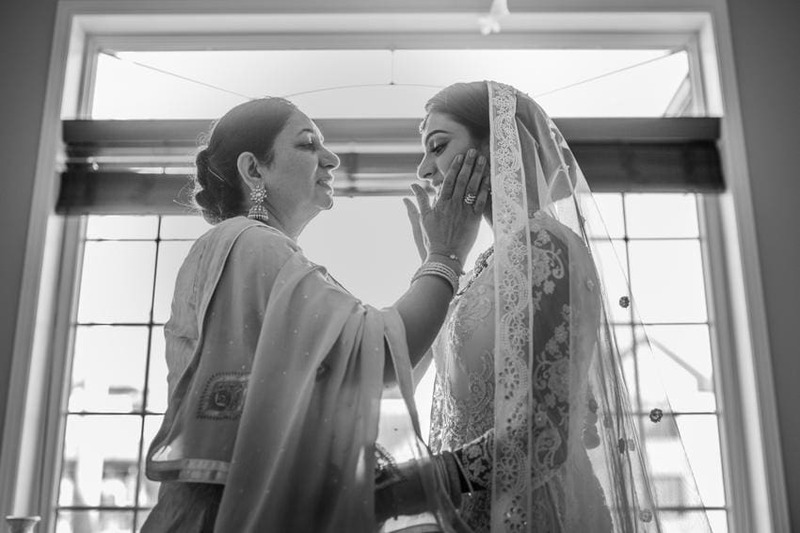 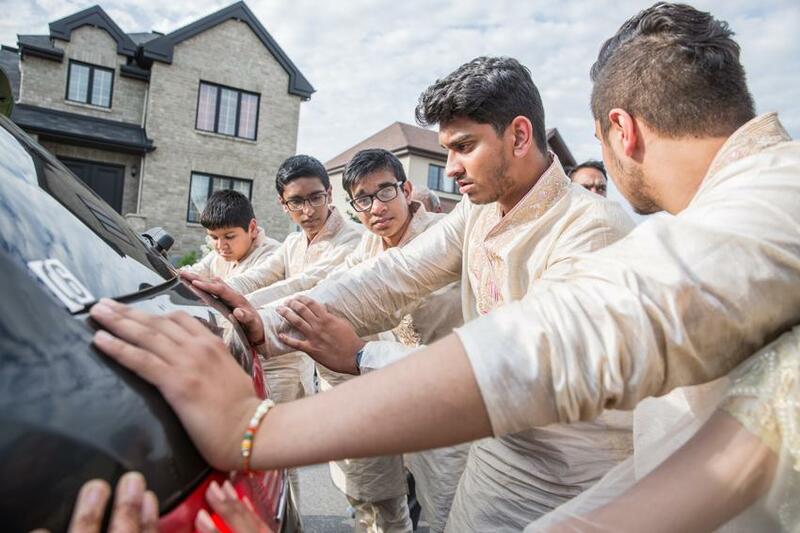 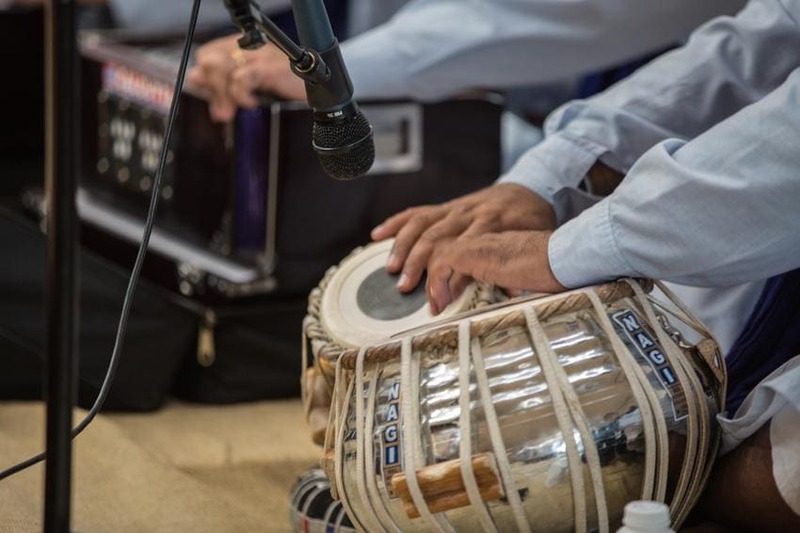 Indian weddings are about emotions and bride’s send off is one very emotional part of Indian weddings. 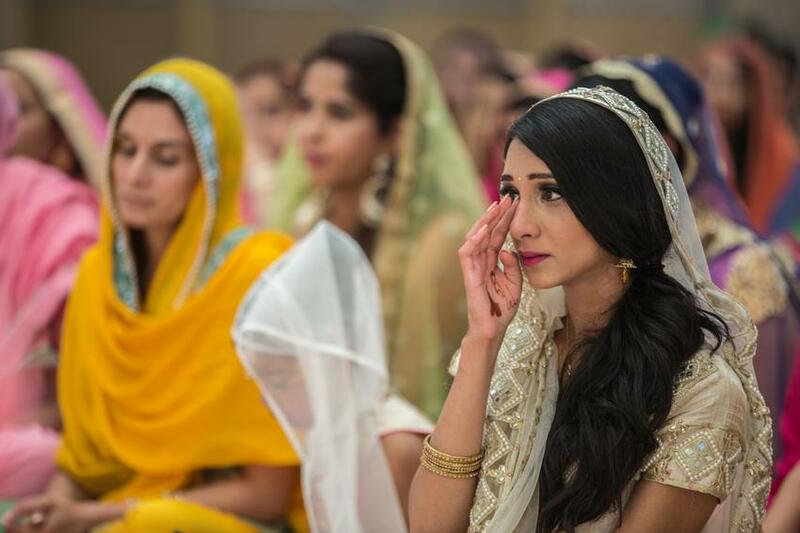 During this ceremony, everyone got teary eyed as their beautiful Indu departed to start a new journey with her husband Manik. 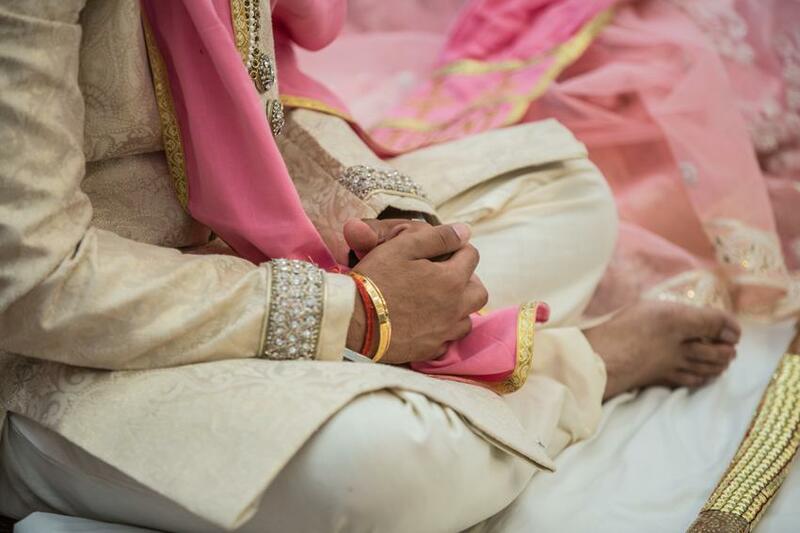 Visit our Blogs page for engagement shoot ideas, locations and tips!